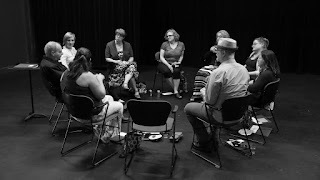 Recently, The Playwrights' Center invited us to a reading of a fantastic new Lee Blessing play: "Minneapolis/St. Paul" about a cross-dressing bigamist, followed by a post-show discussion with the playwright. They do amazing work developing new plays, and we hope to see this one again! Pictured: Minnesota Theater Love, One Girl, Two Cities, Artfully Engaging, Play off the Page, and Cherry and Spoon.